Fencing is a sport with a long history and is one of just five sports to have featured in every modern Olympic Games. In the UK it maintains something of an elitist reputation, in part due to its association with aristocratic duelling but there are moves to make it more inclusive. The sport known as fencing normally refers to Olympic fencing, with classical fencing (which is more martial arts based) and historical fencing other variants of the sport. In this article we shall concern ourselves with the Olympic variety and its three branches, foil, sabre and epée, the sport also known as competitive fencing for a little added confusion! The object of the game is to use your weapon to strike your opponent whilst avoiding being hit yourself. Simple, ruthless and – if you get it wrong – painful. Fencing is only ever contested one against one, although team events exist. The most important piece of equipment is of course the weapon itself of which, as mentioned, there are three kinds: the epée is the heaviest sword, the foil is a lighter thrusting weapon, and the sabre is a cutting and thrusting weapon derived from the cavalry sword. In order to register the scores players’ swords are electronically sensitive, as are the scoring areas of the body, and are connected by a body cord to the scoring box. When a strike is registered there is an audible tone and a light illuminates. Fencers must wear a variety of protective attire to minimise the chance of serious injury. This includes a mask and helmet that completely covers the head and has a tough mesh at the front through which fencers can see but which is strong enough to repel the weapons. A fencing jacket, pads and a glove on the weapon hand are also require, with other pads to protect various areas of the body. Fencers compete on a “piste” that is 46 feet long and around six feet wide. There is a centre line with on-guard lines six feet to either side across the width of the piste and this is where the fencers start each round from. Scoring is done differently in the three variants of fencing. When using the the foil only strikes to the torso, neck, groin and back count and points can only be won using the tip of the weapon, not the side of the blade. With the sabre strikes beneath the waist do not count, the rule originating in the cavalry days when striking an opponent’s horse was considered ungentlemanly. The hands do not register as a hit but the competitors may use both the tip and blade of the sabre to score. As with the foil, should players strike each other at the same time the referee will use the “right of way” rule, awarding the point to the competitor who began their attack first. With the epée the right of way rule does not apply and both fencers may score simultaneously, unless it is the deciding point when neither strike counts. Only the tip of the weapon may be used and the entire body is a target in epée. At the Olympic Games matches are contested over three three-minute rounds, with the winner being either the first to 15 points or whoever has the most hits after the three rounds. Other scoring protocols exist and are usually based on the first fencer to a predetermined number of points, with a five point/three minute system quite common. 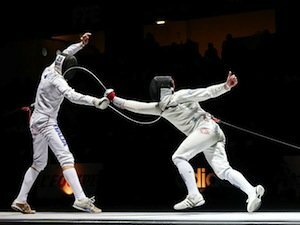 Fencers must salute one another and the referee at the beginning and end of the bout, with failure to do so can result in the loss of a point (the winner) or even suspension (the loser). Points are scored by hitting your opponent in accordance with the specific requirements for the type of weapon being used (as detailed above). In foil, strikes outside the target area stop the contest before resuming afresh, however strikes with the blade (whilst not counting) do not stop the action; the latter rule also applies to the epée. Barging the opponent, using your hand to cover the target zone or foot faults can lead to a points penalty at the referee’s discretion.